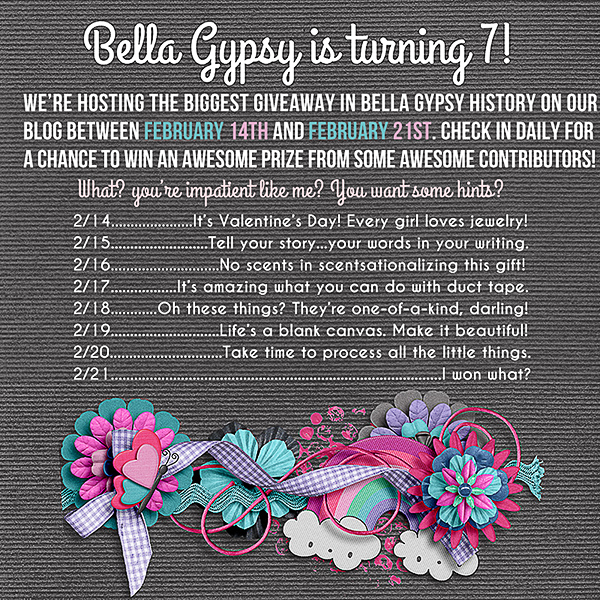 The Big Bella Gypsy Giveaway! Oh my goodness!!! Where do we begin? February is here and that means Bella Gypsy is another year older! Bella Gypsy was born in February 2006 when Tabatha and I decided to take the plunge and begin selling digital scrapbook supplies. There have been times when either or both of us has had to take a break, but our Bella Gypsy baby has always been there as a creative outlet and source of inspiration. Because we’re sisters and best friends, we wanted to do a big promotion centering around that friendship. But that’s not all! 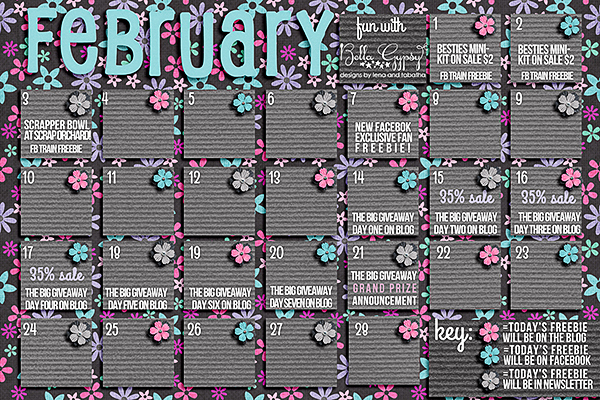 Between February 14th and 21st we’ll be giving away prizes with a total combined value of over $1,000! Well, the Besties mini kit is on sale for $2 but only until February 2nd. On the 3rd it will go back to regular sale price, so I’d suggest you go snag it as your first step! Then, collect your freebies all month long. A third of them will be on the blog, a third will be on the Facebook page, and a third will be in the newsletter. 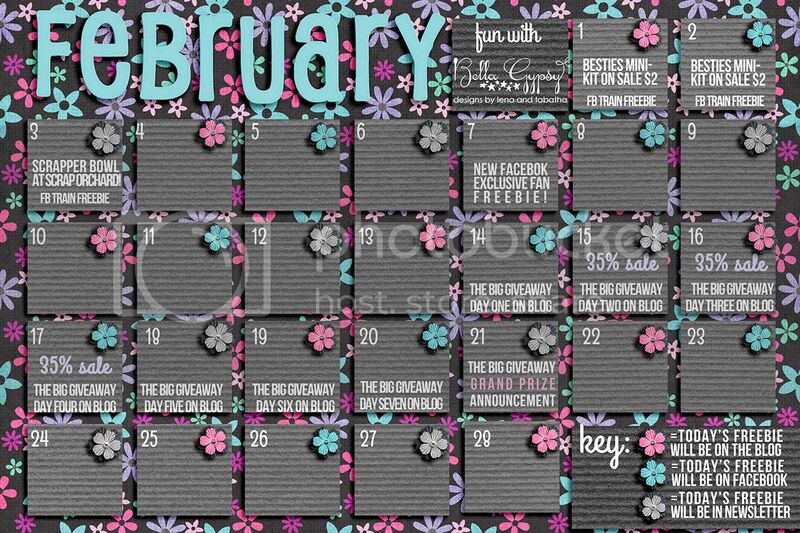 ( See the fun flower key on the calendar to find out where to get your daily freebie). If you’re not signed up for the newsletter, you may do so by clicking on the “NEWSLETTER” link at the top of our site, underneath our header. Then, make sure to check here every day between the 14th and the 21st for your chance to win AMAZING PRIZES! The entry process will be easy, and every day is a new prize and a new chance! You also might want to shop our Birthday Sale Feb 15th-17th…everything will be 35% off! Wow my eyes are glazed over…I’m going to print this calendar and keep it on me so I don’t miss a thing! Sounds like fun. So enlightening to hear of sisters that are besties. so excited. thank you for sharing your birthday presents. Congrats on 7 years Lena & Tabatha!!! What a generous celebration! Thank you! I love your style so much, you have a wonderful aesthetic that draws me in every time. WOW!!! Congratulations Lena & Tabatha (Bella Gypsy)… this month is my birthday too (on 3rd feb) your generous celebration will be a gift to me!! Thank you!! I hope the downloads of the freebies will be available more than 1 day because I can’t use my computer everyday when I’m not at home. Congratulations on seven wonderful years! I’m so glad I discovered you girls a few months ago- your kits are the best! Can’t wait to see all the fun stuff you have in store for us this month! Wow- you guys are amazing! Congratulations on 7 years! Thanks ladies and Happy 7th Birthday! Oh lord, I keep breaking my promise not to buy any more digi stuff for a while! 😉 I swear I’ve tried. I’ve made it to about 19 hours without buying something. Happy birthday ladies, and thanks for all of the fun. Party!! Fun! Congratulations! Thank you for the goodies! Wow, you girls really know how to throw a party!!!!!!! Happy Birthday, Bella Gypsy! You have spent 7 years in the digital community as leaders with HUGE talent!!!! You’ve set trends, you’ve paved the way for others, and it’s been so fun to watch you grow!!! I am a huge fan and I always will be!!!! I am loving this! Already bought the mini kit and it is absolutely adorable!! But I don’t get the 28 days of freebies. Not finding anything for day 3. What am I missing? So much fun! Thank you and congratulation’s on 7 years, Happy Birthday! Birthdays are so much fun and this is a BD Bash! Can’t wait to be a part of it. Thanks so much! Thank you ladies. You are very generous! I had “besties” kit in my cart on the last day of the sale pricing of $2, when my hubby called to tell me dinner was ready,so didn’t go through to check out. I ate dinner and I fell asleep on the couch. My hubby did wake me. Sweet hubby…, but imagine my surprise that I found that the kit’s sale was over ,as I attempted check out at 4am. I slept through the sale. Waa Boo Hoo. Thank U. Congrats and Happy Birthday. May it sparkle. Big Hugs 2 U both.